McGill students have proven they are more than equal to the task – no matter how daunting. Yesterday, Karina Gould, President of the Arts Undergraduate Society (AUS), presented a cheque for $19,673.29 to Oxfam Québec to go toward relief efforts in Haiti. The money was raised in an eight-day campaign in which volunteers crisscrossed campus with red buckets asking for donations. The funds will be matched by the federal government, bringing the total to almost $40,000. On top of the money, the student-run initiative – which was spearheaded by the AUS, but quickly became a cross-faculty movement – also collected about 300 garbage bags of clothes for the estimated 6,000 refugees expected to begin arriving in Montreal within days. 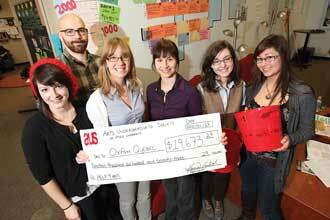 The amount raised far surpassed the AUS’s original target of $6,000. “I’m ashamed to say that at first I thought $6,000 was a lofty goal,” said Gould. “But we blew it out of the water. While the students were busy prying money out of their fellows, McGill’s Security Service personnel were planning their own fundraising drive, which has been in full swing this week. Security agents are combing the campuses, red buckets in hand, in search of support for the Canadian Red Cross.